In May 2000, when the airplane took off from the airport in Amman, my heart was shattered. There was a feeling inside me that longed for my family, friends, and my successful career at the Jordan University Hospital. I was comforted by my husband with the prospects of coming to the greatest country in the world—the land of opportunity & adventure! I was one of the few pharmacists dealing with cancer patients and chemotherapy—research in these fields was my goal and helping those in need was my dream. My husband at the time was a Ph.D. candidate in Electrical Engineering at Georgia Tech in Atlanta. My husband was inspired to pursue an education in the US by his father—the first from his poor family in India to go to college and to move to the US. When in the US (from 1952 – 1960), my father-in-law, a Mechanical Engineer from NYU (1955), would be asked to sit in the back of the bus (during times of racial segregation in the 50’s). He was disturbed by this practice of discrimination against people of color and it became his reason to not pursue immigration or stay in the country, despite a successful career at NYU and at General Motors. My first year in this country was a challenging one for me. I was struggling to adapt to the new language, a new home, and the new faces around me. As a Palestinian who grew up in Jordan, my interactions in Jordan were limited to people who looked like me and spoke my language. I was amazed by the diversity in the US. I never thought I would have the chance to have as many friends from different backgrounds, cultures, and faiths as I do today. I saw this diversity too in my Muslim community. The first time I went to a mosque in the US was to break my fast—something I never did in a Mosque in Jordan. When I arrived, there were hundreds of Muslims from every continent! I saw black, white, and brown skinned people. I heard different languages and tasted different kinds of dishes. A study from the Pew Research Center estimates that there were about 3.3 million Muslims of all ages living in the United States in 2015—about 1% of the total U.S population. 1 out of every 25 Doctors is a Muslim and thousands of American Muslims serve in the military and law enforcement. Muslims are not new here, their history in this country goes back more than 400 years and evidence shows that there were Muslims on Columbus’ ship and 1/3 of the enslaved Africans that were brought to the continent in the 17th century were Muslims. Mohammed Alexander Russell Webb, a writer and a U.S. consul to the Philippines was an early convert to Islam, established a mosque in Manhattan, New York City in 1893. He was the main spokesman for Islam in America and many of America’s most prominent thinkers heard him speak on the Muslim faith, including Mark Twain. Islam is one of the Abrahamic faiths. Muslims believe in the one God, the God of Abraham, Moses, Jesus, and other prophets including Muhammad. Say O Prophet, “We believe in God and what has been revealed to us and what was revealed to Abraham, Ismael, Isaac, Jacob, and his descendants; and what was given to Moses, Jesus, and other prophets from their Lord—we make no distinction between any of them, and to Him we fully submit,” (Quran, 3:84). The three dimensions of Islam include belief, ritual practice, and the effort to improve one’s character (Jihad)—which is perhaps the most misunderstood dimension. Jihad simply translates into ‘struggle’. The ‘greater’ Jihad is this spiritual internal struggle within oneself to improve one’s character. The ‘lesser’ Jihad can be understood as an external struggle in self-defense when attacked. God says “Let there be no compulsion in religion, for the truth stands out clear from falsehood,” (Quran, 2:56). Also, God says, “The messenger’s duty is but to proclaim the message,” (Quran, 5:99). “During the European conquest of Jerusalem in 1099, the Crusaders slaughtered Muslims and Jews alike, including women and children. Eighty-eight years later, Saladin recaptured Jerusalem. The city’s Christians feared for their lives because they were certain that the Muslims would avenge the deaths of their people, and Saladin was in a position to do so. Allah (God) is gracious and benevolent to all of mankind—the ‘Children of Adam.’ And God’s favors bestowed on mankind apply to all and include monotheists, polytheists, atheists, and sinners. “Indeed We have honored the children of Adam, carried them on land and sea, granted them good and lawful provisions, and privileged them far above many of Our creatures,” (Quran, 17:70). The terror attacks of 9/11 didn’t only change our country but also affected how Americans see Islam, Muslims, and the American Muslim community. Today, 16 years after that 9/11 attack, the American Muslim community continues to feel the grief and pain from hate crimes, discrimination and a widespread increase of Islamophobia. I have many Muslim moms come to me, asking if I can convince their daughters to take off their hijabs (head covers). Muslim parents are scared for their daughters’ safety. A report by the Council on American-Islamic Relations (CAIR) shows that incidents of hate crime against Muslims have spiked significantly since 2016 and that 2017 could be one of the worst times for the Muslim community in the US. As a result, many American Muslims like myself have changed their personal goals in life and hold themselves responsible for reaching out to their communities and promoting a better understanding of Muslims and Islam. Unfortunately, studies show that this sincere individual effort is struggling against the propaganda that demonizes Muslims and Islam by portraying Islam as hostile to and incompatible with American values. This divisive propaganda feeds on peoples’ misguided fears, and not only affects the safety of Muslims living in this country but also helps the ‘unislamic’ ISIS and other terrorist organizations to recruit. Last week a non-Muslim friend attended a local town hall meeting. A group of Islamophobics handed out pamphlets to her and others. She was terrified by them and brought these materials to me. I was shocked by the effort they put into spreading fear, even using verses from the Quran out of context and promoting the Un-Islamic acts and practices of ISIS. I have to admit, if I wasn’t a Muslim and I read these pamphlets, I too would be very scared of Islam, Muslims, and Sharia. The Un-Islamic ISIS and Islamophobia groups are similar in many ways: They both broadcast verifiably untrue claims about Islam and they both work to create fear of Muslims and Islam. In 2015, I had the chance to sit down with many middle and high school American-Muslim students attending various school districts. Almost every one of them told me that they were bullied verbally because of their faith by other students and sometimes by teachers, too. They complained of being accosted with names like “terrorist” and “sand n*****”, and with bullying, like, “Don’t throw that bomb on me!”, “Your mother is preparing you to be a suicide bomber”, “Is there a bomb in your bag?”, “What’s up Mohammed?” to name only a few. While it is annoying for them to hear it, most of them choose to ignore it and not report it. When I asked them why they didn’t do anything about it, they replied, “It is just a joke” and “they are just messing around with me.” They also said that if they reported it, they would be bullied even more. When I shared this experience with the interfaith community, there was a sincere effort to do something about it. However, the effort to bring it to the attention of the school administration did not succeed. "I think Islam hates us." This rhetoric led to American Muslims being targeted in the streets, in public transportation, and in their places of worship. On the average, about 9 US Mosques have been targeted every month since the election. While this divisive rhetoric creates fear of Muslims in the minds of many Americans, it also creates fear in the Muslim community—and with the feeling of uncertainty around their safety, Muslims try to hide their identity and many are even afraid to report to authorities the physical and verbal harassment they encounter. It hurts me to know that one of my kindest Muslim friends, who grew up in America and was helping people when she was working in the medical field, and who is now struggling with stage 4 cancer received a visit from two law enforcement officers when she went to pick up her six-year-old son from school. A parent saw her at the school and identified her from her dress as a Muslim and apparently mistook her medical drug feeding device, which she had to carry around her waist beneath her clothing at all times, for a bomb. While the law enforcement apologized to her for their visit, the pain she experienced from this incident is not much less than the pain she feels daily from her cancer. I hear these stories from my community on a daily basis and they’ve left me with a thought that my father-in-law had in the 50’s. The one that led him to leave this country: the country I thought was my home, no longer seems accepting and safe for me. But then this thought is challenged by the fact that I have 4 children who are born in the US and have lived all their life here and that they see no country but the US as their homeland. The primary motivation for me to continue my greater Jihad is to educate, reach out to our neighbors, sit with them face-to-face and answer their questions and counter their fear with truth, facts, love, and compassion. Our mosque sent an open invitation to our neighbors to come visit us, attend our service and program, or simply share food with us, and get to know us. For those who are still afraid to come to a mosque, we decided to meet them where they can feel comfortable. I participate in ‘Honest Conversations with your Muslim neighbors’. A monthly interfaith effort that invites our neighbors in Connecticut to come and meet Muslims and ask their questions with no fear. It is usually held at Public Libraries, churches, and synagogues. A local effort that I began in January 2017 withmy Jewish friend, founder of ‘My Brother From Another Mother’, is ‘Table-Talks’. This is a weekly meeting where we made ourselves available at the mall and coffee shops with a sign that invites a passerby to have coffee and sit and talk with us. While I was trying to promote a better understanding of the Muslim community and reach out to neighbors, these personal efforts have made a huge positive impact to my life and taught me a lot. I have so many friends now across a wide cross-section of people from this great diverse country. Above all, this gives me confidence that there is light at the end of the tunnel. Eman Beshtawii is a wife and a mother of 4 children. She is a Pharmacist and received her Bachelors degree in Pharmacy from the University of Jordan, Amman. Eman is a Co-founder of the Al Hedaya Islamic Center in Newtown, CT and serves as the Director of its Education & Outreach programs. She is a member of the Newtown Interfaith Clergy Association. 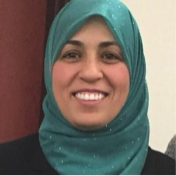 She is Co-founder of the JAM (Jewish And Muslim) women group in Connecticut and speaks at "Honest Conversations with Muslim neighbors", a program that is sponsored by The CT Council for Interreligious Understanding (CCIU), The Muslim Coalition of CT, and The Hartford Seminary. She represented the Muslim community at the 2016 National Prayer Breakfast with President Obama. In 2017, Eman was awarded the Ijlal Mohammad Humanitarian Award “Honoring Positive Examples in The Community”. At Hedaya Eman encouraged & supported youth from the community to found the Math & Science Program enabling Middle & High School Muslim and non-Muslim children from across Connecticut to prepare for and win competitive Math & Science competitions. She helped start the Granada Coding Institute at Hedaya that leverages expertise of software professionals in the community to prepare youth for careers & national competitions in Computer Science & Robotics.